Michael Lamoureux is one of the most prolific writers and experts in the procurement and supply chain areas. 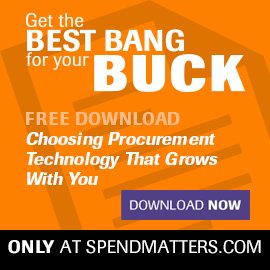 He is joining forces with Spend Matters to contribute to Spend Matters Chief Procurement Officer and related projects. He also continues to serve as “the doctor” of sourcing innovation, a leading resource for education on supply management best practices, technologies and trends. Michael’s path to procurement falls outside the box. After leaving academia upon completing his Ph.D. he worked for a few early e-commerce companies where he designed online databases and virtual shopping carts before most people even knew what the World Wide Web was. During these activities, he stumbled onto a startup that wanted to change procurement forever by bringing optimization to strategic sourcing. His job at this firm, as the first hire, quickly morphed from building the data model, to feed the optimization model, to building the sourcing model itself. After this, he worked on next generation online marketplaces, large-scale global supply and distribution models as well as next generation strategic sourcing decision optimization technology. In 2006, he started his own blog, and since then, has always enjoyed – well, almost always – the banter with Jason Busch and company at Spend Matters. Michael, Jason and the rest of the team are thrilled to be finally collaborating on a formal basis.